Are Barça targets De Ligt and De Jong inseparable? Frenkie de Jong and Matthijs de Ligt were the last to emerge from the dressing room after Ajax's training session. Onana, Schone, Tagliafico and Dolberg all came out before them. However when De Jong and De Ligt showed their faces they were immediately swamped by desperate fans looking to grab a photo with their heroes. De Ligt y De Jong, unidos... ¿e inseparables? The two are great friends and almost resemble brothers due to how much time they spend together. They both would like to play for the same side next season, even if that means away from Ajax, but that isn't up to them. While their futures continue to be debated amongst the biggest clubs in the world, De Ligt and De Jong carry on as normal and show how close their friendship is. They don't just train together, play together, but also car share. De Ligt might only be 19 years old but he's the Ajax captain and the pair travel in his car. De Jong is a natural leader out on the football pitch too. In fact, the only time De Ligt and De Jong were separated when SPORT saw them was when they took photos with supporters. Only they know what they talk about on the car journey home and whether it involves potential transfers away. Since the two met each other at Ajax their careers appear to be going hand in hand. However it appears unlikely they will remain in the same team come next summer due to how expensive each deal would prove to be for a single club. De Jong and De Ligt are both on Barça's wishlist, this is hardly a secret. Pep Segura is leading the potential negotiations but the cost to bring both in would be massive. The price they would be willing to pay to bring De Ligt and De Jong in remains unknown. Would the desire of the players to stick together aid or hurt Barcelona's cause? The story will end one way or another. One, both or neither of the players will join Barcelona next summer. What's clear is the friendship between the two is very strong. 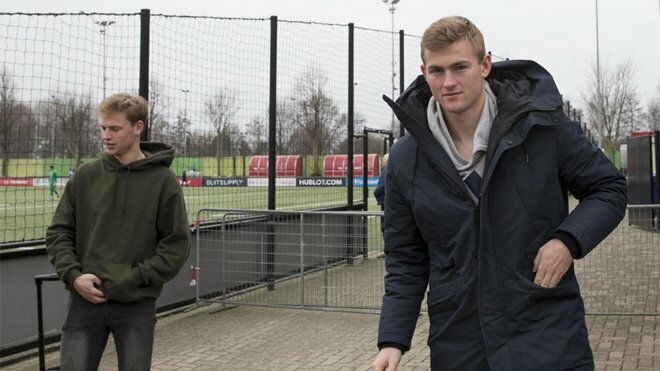 When they left Ajax's training ground De Jong sat in the passenger seat and De Ligt took the wheel - but where will they be heading next summer?